Do you want to design your dream home or renovate your existing home but feel uncertain about how to engage an architect for your project? Are you hesitant to hire an architect’s services because you think architects are expensive? Having an architect guide your project will help you make the most of your budget; so that you get the home you desire with no surprise costs at the end. Your architect will know the critical questions to ask in the initial stages of a renovation or new construction that are key to avoiding costly legal, logistical, regulatory, environmental and design problems. For all the value an architect provides, the architect’s fee is not ‘expensive’. However, we understand that some client budgets just can’t cover the costs for full architectural services. We also understand that some clients have never hired an architect before and aren’t sure what to expect. For clients that may not be ready for or need full architectural services, we offer our Residential Design Visioning service. What is Residential Design Visioning? Residential Design Visioning is an interactive experience offered at a lower cost than full architectural services. It allows you the chance to be involved in the fun of designing your own home and to experience the excitement of achieving your unique vision. In this four part process, we will conduct a site visit to define potential project elements. We will discuss with you what your needs and wants are for your home. This information informs the two concept design plans that we create for your review and comment. The next step is to create a full schematic design of your preferred design concept, including floor plans, exterior elevations and 3D view of the exterior. Then you will have two additional review sessions to work with our team to make any final design adjustments. At the end of this process, you’ll receive the final design package. This package includes: floor plans with basic dimensions, exterior elevations, 3D exterior views from four angles, along with window, door and finish schedules. You’ll take this design package to a builder or general contractor and they will provide you with a construction cost estimate and then work with you to obtain a building permit. You are welcome to further engage UK Architects for additional limited or full design services, but your design package will have everything you need to get off to a great start with your builder. We are also open to including your builder in the design visioning process. This will improve the ability of the builder to understand the important design decisions and ensure that these are respected throughout the construction process. Want to know more but too busy to read this article? Click here to download your free pdf copy of the Residential Design Visioning process to read later. This residence is located in Essex, NY, on the west side of Lake Champlain. Our team made a site visit to explore their property and from there went through a project programming exercise to determine how many and what type of spaces were needed in the home design. We then had two design consultations, each lasting half a day, in order to develop the house design. During these consultations, the owners had direct input with our team on the design of their home. 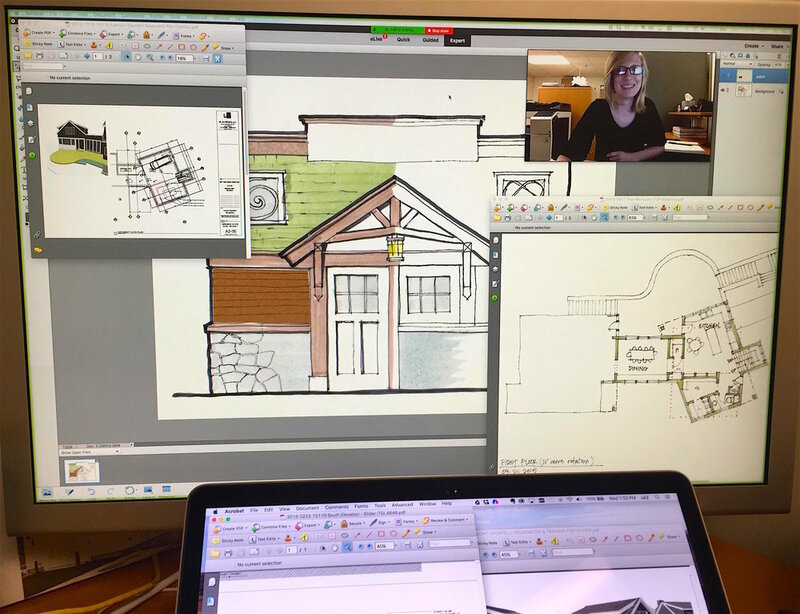 Once the design consultations were completed and the owners satisfied, our team followed up with online screen sharing sessions to go over final design tweaks. From there, the construction documents were drawn up and delivered to the owners. This project was completed in late fall of 2018. We’re excited to see the finished home! This was a fun project! We were engaged to design a new house on the site of an existing log house with spectacular views looking from New Hampshire towards Vermont. The log house had deteriorated and unfortunately suffered from bad design. The owner had recently retired and now that the house was becoming a full time residence, he needed to do something that better met his needs. Having not worked with an architect before and needing to understand his options, the Residential Design Visioning process was perfect for his situation. This project was completed in summer of 2018. This project came to us after the client had worked with 2 other architecture firms. Unfortunately, both of the previous firms were unable to come up with a design that satisfied the client. We listened to her concerns and thoroughly discussed the client’s needs. The most important part of the Residential Design Visioning process is making sure we understand of client’s desires for their home so that we can create design concepts that provide for the spaces they need. The main challenge on this project was keeping the addition from overwhelming the original cottage. We were able to create a design that the client loved. The use of 3D drawing helped us to accurately show her what her addition would look like before it was built. This project is an example of a client engaging us with the Residential Design Visioning process and then moving beyond the scope of this process to later consult with us in targeted ways. This is a good example of the flexibility of the Residential Design Visioning process. This house is for a young family on a spectacular site in Lyme, NH. The concept for this home was to create a modern farmhouse. Due to the amazing 270 degree views, we wanted the main space of the home to feel like the family were living in the view. The design solution to achieve this was to combine a traditional farmhouse form with a totally modern form. It’s almost as if the modern form was an addition onto the traditional form. The living room is the modern form and is almost like being in a fishbowl. This space is open, airy, and light-filled. It has a flat roof so that the bedrooms on the second floor of the traditional portion of the house can see out over the modern portion’s roof. There is also a roof deck accessed from the second floor of the traditional portion. After completing the Residential Design Visioning process, the client consulted with us in limited and targeted ways. Anytime they thought about modifying the design, they reached out to us for input. As you can see from these case studies, the Residential Design Visioning process is a flexible alternative to hiring an architect’s full services. At the end of this process, you can choose to continue working with our team to get the full value of an architect’s services but if you do not, you will have what you need to work with a builder or contractor to complete your project. Your builder or general contractor will provide you with a construction cost estimate and work with you to obtain a building permit. Click here to download your pdf copy of the Residential Design Visioning process. February 14th is a day to celebrate love of all kinds and this year we want to share with you the things we’re loving this winter. Co-Principal Sloane Mayor is loving the current residential transformations she’s working on. We have several residential renovations in the office and Sloane always gets super motivated through discussions with clients about discovering the potential of their current spaces. You’d assume a renovation is about adding more space but sometimes it’s more about redefining what’s already there. And of course we always talk about improving energy efficiency too. Nothing like improving your own space and reducing your impact on the planet at the same time! Sloane and Chris both love getting their hands on a residence and reshaping it into a home our clients will love. What UK Architects Founder and Co-Principal Chris Kennedy loves right now is our big move to a new studio space. Our current studio is a basement office space so we’re all excited for a space with daylight again. Interesting fact: currently 84% of our staff is female, our move into the new space will allow us to add 3 studio dogs, resulting in our staff being 90% female. Chris finds this transition to a majority female firm in a male dominated profession really exciting. We’re also feeling the love from you; our supporters, collaborators, and clients. Whenever we get replies to our newsletters, congratulations for a win or a glowing testimonial, it’s confirmation that we are having a positive impact on our community. And that feels really good. UK Architects’ aim is to create lasting value by enhancing the way people live and interact and by contributing to a community’s character and service to its members. To learn more about our services, click here. UK Architects was engaged by Long View Forest to transform an unfinished structure intended to be a single family residence into their new headquarters. Long View Forest offers a complete range of services to forest owners interested in an active approach to caring for their land. We knew that the client’s new headquarters needed to reflect their approach to forest management in the design and material choices. We were excited for this challenge and created an elegant solution that is sustainable, energy efficient and accessible. 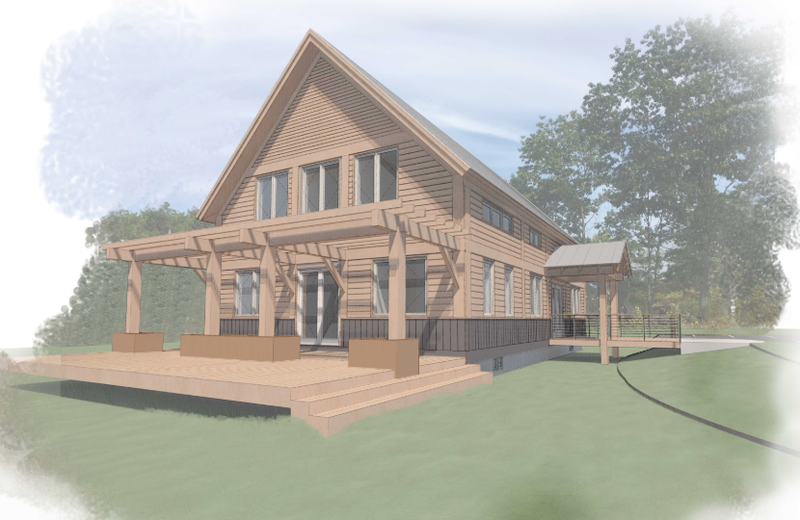 The site is a 27 acre property in Hartland, Vermont, that included an unfinished two-story hemlock timber frame building that was originally constructed to be a single family residence. 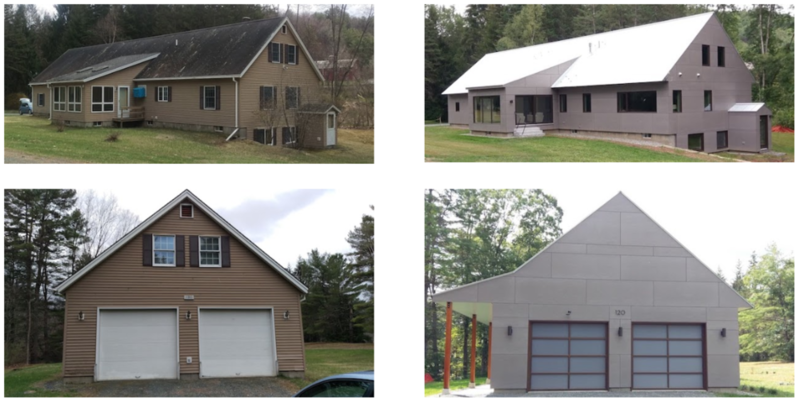 We began with this unfinished structure and made extensive modifications and additions to create a 2400 sf two-story building with great views of Mt Ascutney providing work space for approximately 15 people. The main entry is accessible, our solution for this was to create a berm about 10 ft from the face of the building with a sidewalk grade sloping up to an elevation that matches the first floor. Then there is a bridge from the berm to the entry door. We found that by keeping the berm away from the building allows for water to drain away from the building without the need to provide any catch basins or piping. This also provides a clever and interesting entrance to the building. The base of the exterior walls will have vertical siding that is finished using the shou shugi ban process (http://shousugiban.com/overview/). This provides the darker material at the base of the building that will visually ground it and the shou shugi ban treatment provides this siding with great resistance to rot and low maintenance. A notable feature of the building is that the exterior walls utilizes a “rain screen” system. The siding is being milled from larch that was harvested by the owner. The siding is 1x6 larch boards spaced apart ½ inch over strapping and continuous insulation. This is all installed over the sheathing which has a fluid applied air barrier. There is also additional insulation inside the wall framing cavity. We have had good success with this insulation detail and this has resulted in some very energy efficient projects. During construction a blower door test will be performed to identify any locations in the thermal envelope that are not properly air sealed. The lighting all qualifies for energy efficiency rebates from Efficiency Vermont and so does the heat pump system used to heat and cool the building. Furthering the energy efficiency and sustainability goals of this project, the client has an agreement to install a ground mounted solar array at the sound end of the property. They have future plans to design and construct a shop building for their work crew and maintenance of their vehicles. This project is currently under construction, to see more project images, click here. To learn more about UK Architects’ services, click here. A recent project designed by UK Architect's Principal, H. Sloane Mayor is featured on the Entrepreneur Architect Blog. Every week Entrepreneur Architect highlights a project in their Behind the Design series. Click here to see the full article River House. Enjoy. We all know that apartment rents are reaching into the stratosphere. Here is a way to provide affordable housing and for the average home owner to make some money doing it. Seems like a win-win. In almost every project there are bits and pieces of un-utilized space. One of the things we enjoy doing in our designs is to find ways to utilize those bits and pieces in a creative and sometimes unexpected way. These design solutions are often some of the favorite parts of projects for our clients. Here is an example of using the space under a staircase to create a unique storage solution. The drawers open by pushing in on the drawer front which then releases a spring loaded opener. When the drawers are all closed the wall has a clean appearance of matched boards. We have found that sometimes it is the simple and unique things that that make all the difference in the satisfaction and delight of the clients we work with. As a professional Real Estate Agent, you sometimes have to sell the potential of a property and you’ve probably had more than one ‘problem’ listing in your career. How many of your clients are enamored by HGTV shows like “Love It or List It”, “Property Brothers” or any of the myriad of house flipping shows? You don’t have a production crew or the team of professionals that your clients see on TV. Or do you? What if you had a resource, armed with design thinking and creativity, that could help your clients see the potential in that problem property? If you could help your clients understand what’s possible and what’s involved in turning that diamond in the rough into their dream home, would you be like their very own HGTV star? UK Architects created a system to help Agents and Sellers show Buyers the untapped potential in a listing. Through their simple, 3-step system of photographing, sketching and narration, UK Architects produces videos that help get buyers excited about what's possible. Agents and Sellers can get excited about a Buyer that not only sees the vision and the cost, but also the potential of increased property value. UK Architects' ability to evaluate, sketch and provide realistic visions for difficult properties, can effectively connect with those buyers who need that extra bit of confidence that they will be purchasing a property that will really work for them. If you are a Real Estate Agent, you can be like an HGTV Star for your clients. Bring in your team of professionals to provide a little vision, a little perspective about what's possible and what's involved in turning that 'problem' listing into a dream. Click here to contact Chris Kennedy and UK Architects and become the Star that your clients are looking for. This makes sense to us, what about you? Here is a link to an article about a study that describes how architects' and artists' brains work differently. Part three concludes our case study of Miller Bicentennial Hall. Learn more about UK Architects’ project here. Giving new life to an existing resource is an act of sustainability. An original campus plan called for demolition of the Miller Building. Instead, UK Architects took advantage of the building’s solid foundation and repurposed it, thus retaining the embodied energy of the many lives that flowed through its original doors. UK Architects ensured the building’s energy efficiency by improving the thermal envelope with insulation and paying attention to the elements of light and air within and without the building. New, high-efficiency lighting uses less energy, and lighting controls such as occupancy sensors and daylight monitors allow the building to self-monitor its energy use to a degree. Effective air-sealing allows for optimal energy use, and a mechanical system with an extremely high coefficient of performance saves energy. CO2 monitors help control the introduction of fresh air, creating a space with less waste. Natural light was also taken into consideration, such as in atrium-style library reading room. This is part two of our case study of Miller Bicentennial Hall. Part three will explore aspects of the design that make it sustainable and energy efficient. Kimball Union Academy was founded in 1813, making it one of the oldest private schools in the United States. The school was originally built to prepare young men for the ministry, and has since become a co-educational institution that upholds the values of concern for others and mastery of both academic and leadership skills. The school is located on a hilltop in the upper Connecticut River Valley, and the 1300-acre campus is surrounded by incredible natural views and lush vegetation. A sense of place and community is paramount to the Kimball Union experience. The campus is populated with unique, historic structures, the oldest being the Daniel Kimball barn built c. 1790. The architectural styles of the campus buildings include Federal, Cape Cod, Greek revival, Colonial revival, and Classical revival. Many of the older structures serve as faculty and student housing. The original Miller Building was built in an era of quality construction.The straightforward, classically-inspired structure was very well-suited to the various functions it served over its first 50 years. With its current updates, the structure is ready to weather the future. Miller Bicentennial Hall currently serves more than twice the number daily occupants than it did before renovation. It has been expanded by an addition, increasing the total area by 20 percent. The mechanical system was replaced and now includes air conditioning, but the building consumes 30 to 40 percent less energy than it did before the renovations. This is part one of our case study of Miller Bicentennial Hall. Part two will explore the context and structure of the design. Kimball Union Academy emphasizes community learning that occurs not only in the classroom, but also through chance meetings and social engagement. To accommodate this commitment to collaboration, UK Architects implemented locations throughout the building where students and faculty who are not in class can find places to sit and engage with each other. The library is the central hub of the building, both theoretically and physically. Students have access to community spaces with large tables that are ideal for group projects, as well as private rooms with windows for more focused or individualized endeavors. The humanities classrooms surround the library, allowing for the unique integration of class curriculum and library resources. UK Architects designed this master closet/dressing room in a Norwich, Vermont residence to fit seamlessly into the minimalist design of the home as a whole. By focusing on small design details, we created a peaceful, private dressing room that makes exceptional use of space and light. A full-height window with frosted glass lets in ample daylight while providing privacy. The windows throughout the rest of the home do not have curtains, and adding window coverings to the full-length window in the master closet would have been out of place with the clean lines of the residence. The window faces a yard where visitors gather, necessitating frosted glass. The other window in the dressing room is made of clear glass, allowing for additional natural light and views of the yard and trees. The built-in hanging areas and dressers use the space efficiently, and free the bedroom area of clutter. Check out our other residential design projects for examples of how we work with clients to create homes that reflect their personalities and facilitate how they want to live. The four-part, intensive process of Residential Design Visioning is an interactive experience offered at a lower cost (typically 2.5 - 3.5 percent of construction costs) than full architectural services. It allows you the chance to be involved in the fun of designing your own home and to experience the excitement of achieving your unique vision. The UK Architects team conducts a site visit in order to define potential project elements. The team discusses with you how you want to live in your home in order to personalize the design, taking into account the scope of the environment. This includes diagramming of the relationship between the parts of the house, site orientation, and the relationship of interior and exterior spaces. You review concept designs with the design team and make modifications to the designs. Together you develop a preferred concept design in plan view and exterior 3D concepts for the design. Architectural Design Magic: Following the second session, UK Architects develops a full schematic design of the preferred design concept, including floor plans, exterior elevations and 3D view of the exterior. They send the schematic to you for review and schedule the next session. You meet with the design team either in person or via an online meeting with screen sharing. The team discusses options for modifications and refinements of the schematic design. This is an opportunity to make “live” changes to the drawings and 3D views. Architectural Design Magic: Following the third session, UK Architects makes appropriate changes to the design scheme. The team shares the revised scheme with you for review and schedule the final session. You meet with the design team either in person or via an online meeting with screen sharing to review the revised design scheme. Minor adjustments following this final meeting are to be expected. Final Architectural Magic: UK Architects makes the final adjustments to the schematic design and develops the final design package. This package includes: floor plans with basic dimensions, exterior elevations, 3D exterior views from 4 angles, along with window, door and finish schedules. Contact UK Architects today to begin making your dream home a reality. The oppressive nature of the ubiquitous “cubicle farm” and the noted failures of open office plans beg the question: how can offices retain their collaborative nature yet minimize distractions and preserve privacy? Reverting to traditional closed offices is tempting, but costly. UK Architects finds a more productive, and cost-effective, solution in hybrid office design that balances workplace privacy with a sense of community to foster creativity and collaboration. A hybrid office space features a diversity of workspaces and offers employees the autonomy to move through the spaces throughout the day depending on their needs. UK Architects focuses on the specific needs of clients, typically including open areas for collaboration, semi-private spaces for smaller groups, and private areas for individual work. Workspace design involves competing elements, such as cost and company culture, that must be balanced. Office spaces typically do not directly generate revenue, so cost is of primary concern in designing and building the space. Open office plans may fit more people per square foot at a lower cost, but employee productivity often decreases without private spaces to independently explore ideas and to hide from the inevitable distractions of the open office. Hybrid offices may have a higher cost per square foot, but the design often has a lower cost per person. On a recent high-density office space project, UK Architects recommended creating individual, three by five foot office spaces (35 square feet) with three frosted glass panels that could slide partially or fully open, creating the option for visual openness and audio privacy. When the cost of the sliding panels became prohibitive, UK Architects re-imagined the design with one sliding panel and two fixed panels. The new design was more cost-effective for this particular client, but it maintained the element of optional private spaces for the 42 employees in the office. Given the flexibility of the hybrid office plan, Kennedy finds it is easier for employers to pitch it over a completely open office plan. “In this case, the glass panels really sold it,” he says. “You can tell the staff: the space is still yours, but now it’s really modern and refreshing.” By tailoring the design to the needs of a company’s unique culture, UK Architects creates collaborative spaces that are a major departure from the early days of open office floor plans synonymous with startup companies and Silicon Valley. According to Kennedy, the shift away from traditional or fully open offices towards hybrid workspaces is exciting. “It’s like moving from the suburbs to the urban center of town.” A hybrid office affords companies the opportunity to implement collaborative, productive spaces that suit the needs of their employees and culture. Contact UK Architects today to discuss the unique needs of your project. Have you ever considered hiring an architect, but found it would be too expensive? You’re not alone. Architects are involved in the design of less than 2% of homes in the United States, due in large part to the high cost of full design services. 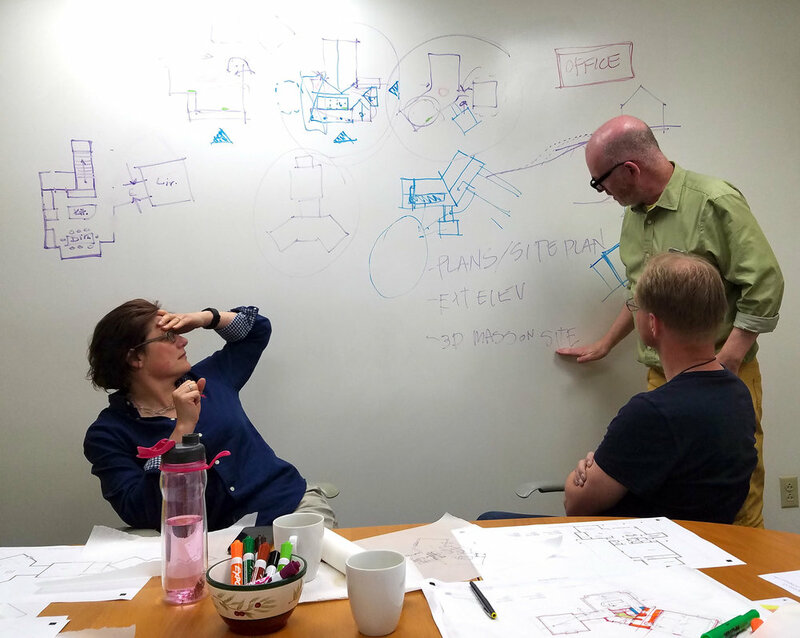 UK Architects seeks to expand the availability of design services with Residential Design Visioning, an intensive, collaborative design service that provides clients with the essentials of residential design. Residential Design Visioning “really comes to the core aspect of why you want to hire an architect,” says Chris Kennedy, Principal at UK Architects. “We can help create a pleasing design and add value to your home, but we will also take into account how you want to live your life.” While architectural design increases the value of a home, full design services are often cost-prohibitive. The smaller scope of Residential Design Visioning provides the main benefits of architectural design at a lower cost. The four-part process, costing approximately 25% of full design services, kicks off with an onsite visit. The UK Architects team obtains environmental details such as the direction that the winds blow, where the sun rises and sets, orientation of the best views, how the site is accessed and develops an understanding the topography of the land. Clients answer questions to assess what type of home will suit their lifestyle – examples are: Would they prefer formal spaces or an open floor plan? Where will they spend the most time, and how can the design optimize daylight in those spaces? After settling on a design concept refined by the design team, the next steps are to refine the plans and to develop 3D visualizations of the exterior of the home, along with some interior views. After this burst of collaborative effort, the client reaps the benefits of the essence of architectural services in the form of a schematic design package. Moving forward, the client would engage with a builder for a cost estimate and permitting requirements. UK Architects would remain available to provide any additional services needed during the completion of the project. He explains that an architect could have developed a design to optimize the incredible views and increase the livability and value of the property. While builders often opt for methods or materials that lessen costs, an architect takes a creative, sustainable approach to methods and materials and a holistic view of the environment. The result is a home with higher value, making the investment in architectural design services worthwhile. Depending upon the scope of the project, it is likely that the design fees for Residential Design Visioning will be 2.5 to 3.5 percent of the anticipated construction costs of a home. For example, Residential Design Visioning services for a home (1,500 to 2,000 square feet) with $500,000 in anticipated construction costs would likely cost between $12,500 and $17,500. Full design services for the same home would typically cost between $50,000 to $90,000. Residential Design Visioning limits the scope of design services to focus on the overall flow, layout and character of the home, allowing the builder to proceed according to the client’s vision at a fraction of the cost of full design services. To learn more, click here to download your free pdf copy of the Residential Design Visioning process informational guide. Contact UK Architects today to take the first steps toward your dream home. One of our recently completed historic preservation projects, the Langdon, New Hampshire Meetinghouse has been selected by the New Hampshire Preservation Alliance to receive a 2016 Preservation Achievement Award for rehabilitation. For over 25 years, the N.H. Preservation Alliance has been helping New Hampshire communities make important progress to save and revitalize critical historic landmarks, encourage investment in community development, and communicate the social and economic benefits of preservation. Their awards program offers a wonderful opportunity to honor the best recent work, showcase milestone preservation projects from the past, and continues to inspire others. The Langdon Meetinghouse was originally constructed in 1803 and continues to add to its New Hampshire record setting number of years in continuous use for the annual town meeting. It is now 213 years running. What is a Street? Why are some so Awesome? Here is a link to a recent article in the NY Times describing "Favorite Streets in 12 European Cities". We wonder if there are remarkable streets in Northern New England. For many projects there are numerous steps in the selection of materials. Even though it seems like it should be pretty straightforward there a a number of things that need to be considered and there are things that can go wrong making the process more complicated. Here is an example of how we selected brick and mortar colors for a project that is currently under construction. This specific project is a 4 story office building with 3 1/2 stories of brick on the facade. There are 3 colors of brick and 2 colors of mortar that were chosen for the project, and on top of that, there are a handful of other materials that make up the rest of the exterior facades. These other materials include precast concrete lintels and trim, fiberglass windows, aluminum doors & frames, caulking, stucco and colored metal trim. In this project we determined that we wanted the base of the building to feel heavier, so we chose to make this a darker color. The middle 2 floors are also brick and we chose a lighter color. To make the building feel progressively lighter in weight as it grows up, we chose to make the top level the lightest color. In order to enhance the window openings in the building, we chose a 3rd color of brick, the lightest color of the the 3, to create large panels that give the sense of the windows being larger element in the design.